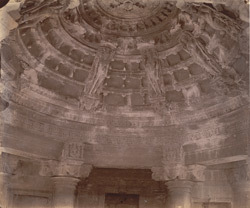 Photograph of the domed ceiling of the Adinatha Temple, Mount Abu, taken by O.S. Baudesson in 1882. The Jain temples at the Dilwara complex at Mount Abu in Rajasthan are an important centre of pilgrimage. They are constructed entirely of marble and are richly embellished with extraordinarily light, delicate and intricately carved sculptural detail. The Adinatha Temple was founded by Vimala Vasahi, a minister under the Solanki ruler Bhima I. It is the oldest temple at Dilwara and dates from 1032 and later. Around a central shrine containing an image of Adinath, are arranged 52 cells each with an image inside. This view shows the sculptural decoration of the ceiling dome, including brackets fashioned as maidens and the central lotus bud.